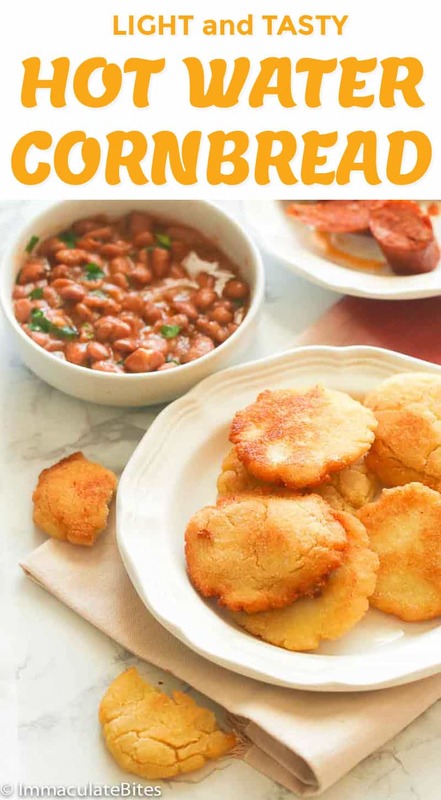 Hot Water Cornbread – Warm, crispy edges and soft center fried cornmeal patties – a wonderful side to any greens, beans, soups and even fried dishes. So easy to make with less ingredients! Hot Water Cornbread is a Southern staple. But even back in Cameroon and most parts of Africa, cornmeal is an integral part to our diet. I already lost count on how many “corny treats” are there, and each of them is always dear to my heart. 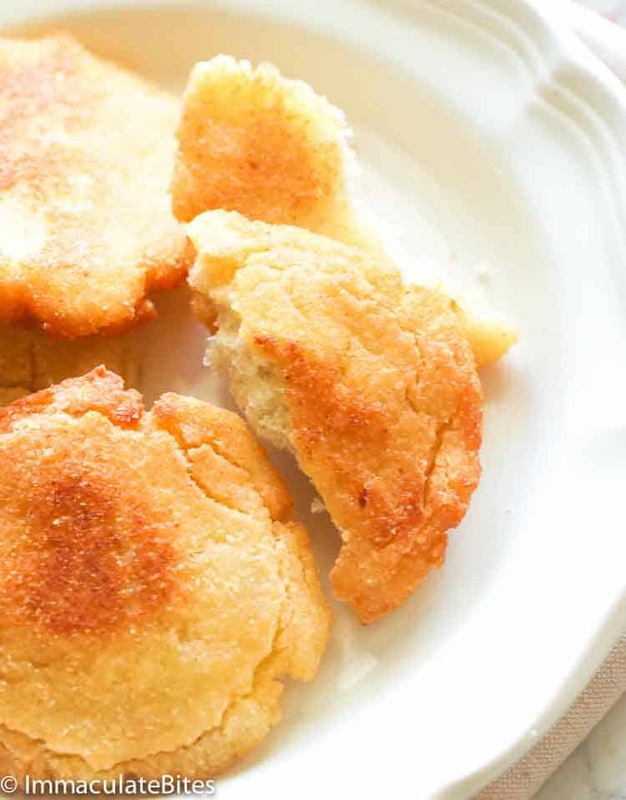 As for the name, it points back to its cooking method in which cornmeal is softened by hot water before forming them into patties and frying on the skillet. 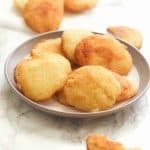 These corny treats could be in ball forms like these Hush Puppies HERE or a breakfast favorite like this Southern Hoe Cakes. 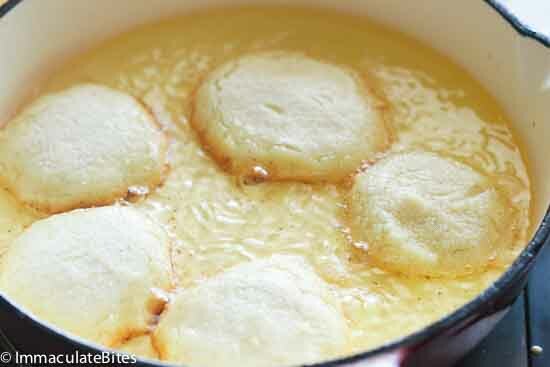 But unlike those two cornmeal recipes above, these Hot Water Cornbread doesn’t contain any leavening agent . Yes, you heard that right! It usually calls for 3 basic ingredients (how cool is that? 😉 ), however, if you’re like me who wants doesn’t settle for bland recipes, I’d say throw in sugar or salt to add flavor. The batter’s consistency will determine how you want your cornbread’s texture is. 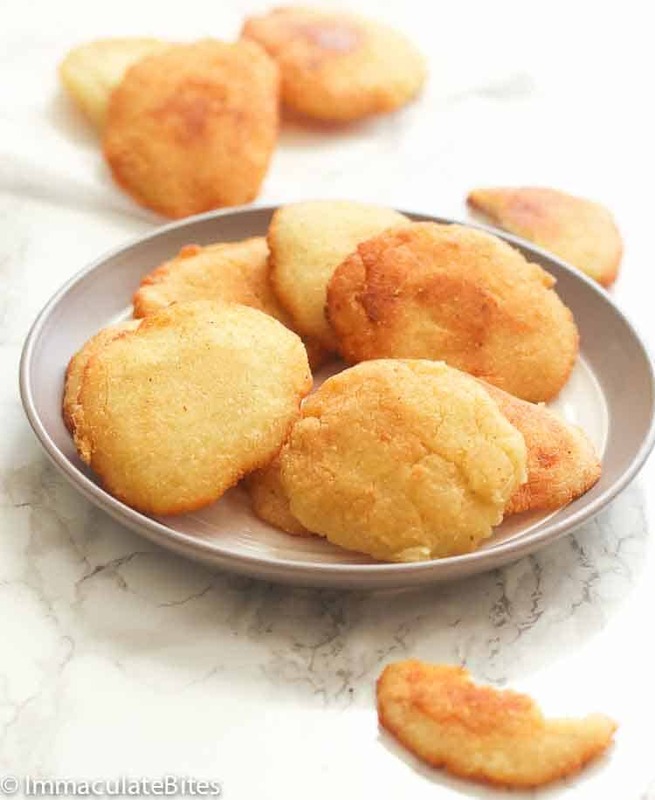 If you want soft and dense water corn bread , then your batter should be thick , however, if you love that crunch, you can make your batter thin with the consistency of oatmeal. In short, it all boils down to your cornmeal and water ratio. Don’t worry though, if you’re not sure yet on what’s your kind of jam, you can start with a thicker batter and fry two patties and see if it hits the spot. If not, add more water to the mixture to have a thin consistency. 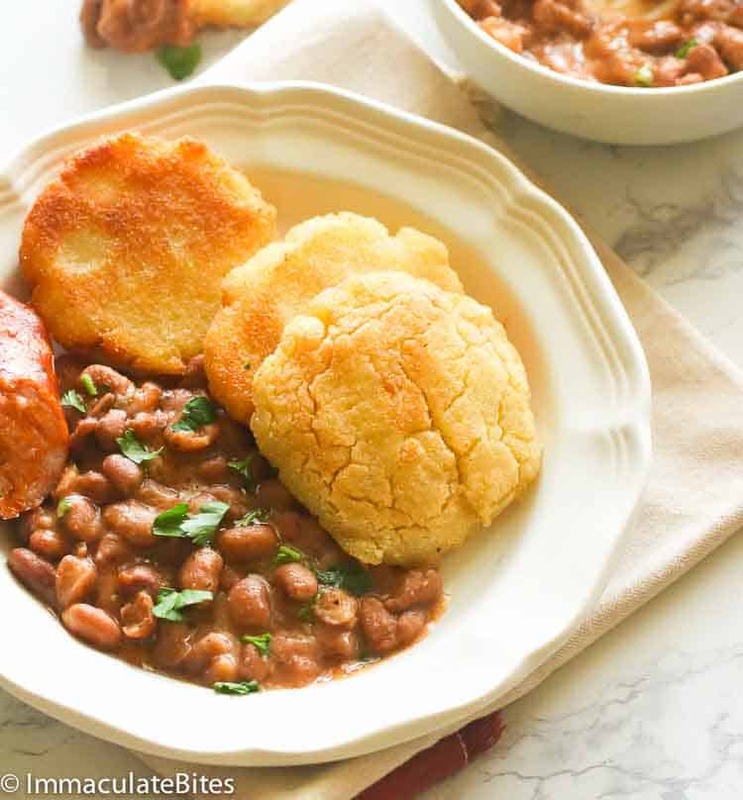 These Water Corn bread (okay technically, it’s not a bread..there I said it..) can be served with your favorite bean dishes, collard greens or this popular fried catfish. I swear, if you can’t get enough of cornmeal, you can add this to your regular snack time. You’ll surely jump for joy . Now buckle up and grab all the cornmeal you’ll have for this year. ” Enjoy eating! If you want soft and dense batter, you can have a thick batter, but if you love that crunch, you can make your batter thin with that consistency of an oatmeal. 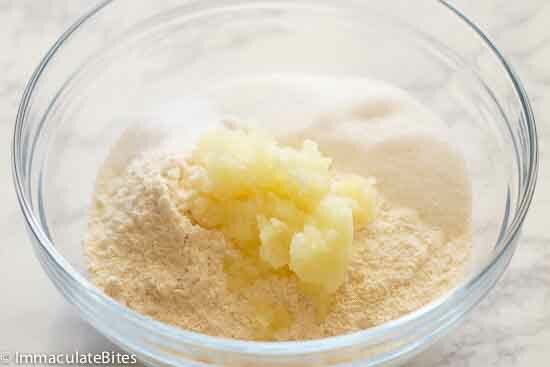 To lighten the texture of your cornbread, replace 2 tablespoons of cornmeal with 2 tablespoons of flour. You can also snack on these with maple or cane syrup as toppings. 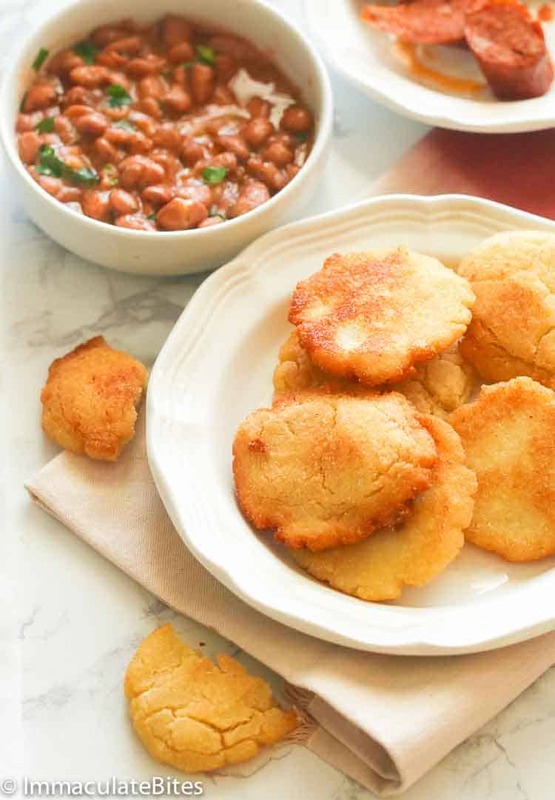 Southern Water Cornbread - warm, crispy edges and soft center fried cornmeal patties that serves as snacks and a wonderful side to any greens, beans, soups and even fried dishes. So easy to make with less ingredients! 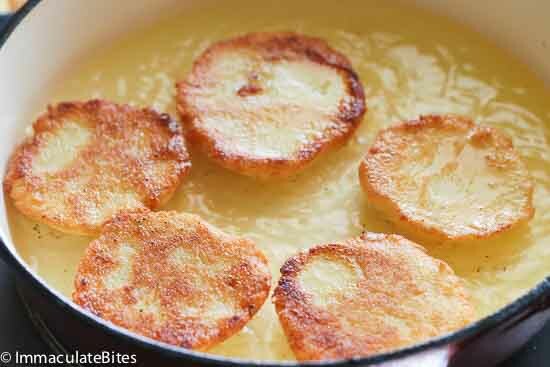 In a large bowl, mix cornmeal, salt, sugar, grated onion, melted butter. Add boiling water. Through mix until cornbread mixture is smooth. Heat oil in a cast iron or frying pan over medium high heat. 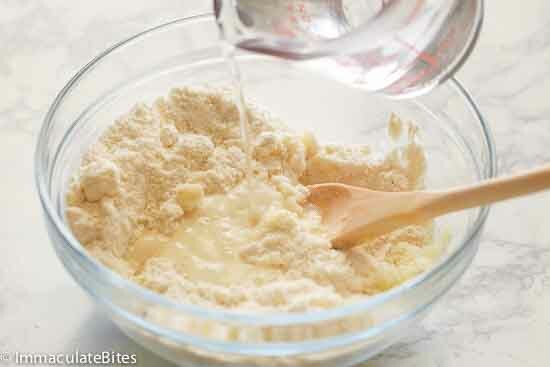 If using your hands, wet them then scoop about 3 tablespoons each of the batter into the palm of your hand. If mixture crumbles, add more water. Flatten then gently drop into batter. Or use a spoon to drop into oil. Fry each cornbread until brown and crisp; turn with a spatula, and then brown the other side about 3-5 minutes. Remove, drain on paper towels and serve immediately with greens, pinto beans or for breakfast. In a large bowl, mix cornmeal, salt, sugar, grated onion, melted butter. Thoroughly mix until cornbread mixture is smooth. Heat oil in a cast iron or frying pan over medium high heat. 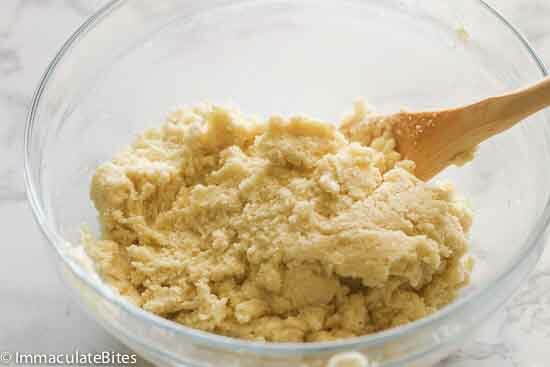 If using your hands , wet them then Scoop about 3 tablespoons each of the batter into the palm of your hand. If mixture crumbles , add more water. Flatten then gently drop into batter. Or use a spoon to drop into oil. Fry each cornbread until brown and crisp; turn with a spatula, and then brown the other side about 3-5 minutes. Remove, drain on paper towels.and serve immediately with greens, pinto beans or for breakfast. Thanks My Friend. Recipe updated! These are so gpod! I made these to go with my home canned pinto beans. My son was like what is that, and I was like mines, not yours, lol! Another keeper recipe. Thanks for this recipe! I’d never heard of hot water corn bread, but I’m going to surprise my (very southern) girlfriend with it tomorrow:) I really appreciate the care you took in fool-proofing this recipe with photos and simple tips for changing the texture. Awww, that’s sweet of you, E.R. Hope she likes it. Happy cooking and thank you for stopping by! N. Rocky Mts & Rainbow Trout grilled or cooked in a Rottisserie with lemon, butter & onion is better than salmon. But neither one are Southern Fried Catfish, hushpuppies or Hot Water Cornbread (we called those Corn Fritters). When the craving hits…..well, you know! 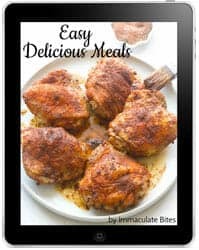 5 stars+ for your recipes! Thank you so much for sharing your thoughts, Patty! I appreciate it. Nothing beats a recipe that brings more than just good flavor but also happy memories. 🙂 You’re always welcome here in my humble little kitchen online. Happy weekend! up there. She took the Southern style cooking – hot water corn bread and other Southern dishes along with her. Lord, your story is so interesting!! Great! So happy to hear this. Thanks for stopping by! Hi Mimi, I haven’t tried using jiffy mix on this recipe. But I guess you can, although there’d be a slight difference in texture. Please let me know how it goes. Nope it will break up…but you can add a little to make the consistency better. This looks very delicious! Although Nigerian am going to try it! Thanks a lot for this recipe! wow,,,great…I think this is a simple dish and easily prepare…This is really a time saving one..so I can make it for my kids when they are coming back from their school. I am a city girl with southern roots. I enjoy hot water cornbread and cook it as a side to any greens or beans. My Cameroonian husband loves it too.